When nonprofits marry tried-and-true fundraising techniques with social media, social fundraising is the result. Social fundraising is only a couple of years old and very much an emerging practice, but it has already shown tremendous power and promise in its ability to turn an organization’s stakeholders into fundraisers. With 90 percent of nonprofits having a presence on Facebook in 2011 and virtually all nonprofits having some presence in social media, best practices in social fundraising are evolving quickly as nonprofits use measurement to learn what works best. Social fundraising can be defined as “people asking personal networks to give support.” It encompasses more than just the transactional act of making a donation; it includes many ways in which individuals and their friends can support social good efforts. For example, when NTEN launched its annual fundraising effort, it enlisted the help of influential members and asked them to create online social fundraisers and reach out to colleagues. In a social media world, anyone can become a philanthropist for a charity, whether they have been in the organization’s database for years or whether they have just connected with the organization for the first time. The number of nonprofits adding social fundraising tactics to their bag of tricks has been steadily increasing: 46 percent of nonprofits in the NTEN Benchmark Study reported doing fundraising through social networks and social fundraising platforms in 2010, up from 38 percent in 2008. Although the dollar amounts raised by individual organizations may seem modest, with the majority of nonprofits raising ten thousand dollars or less in 2010, the total raised through social giving is increasing. According to the quarterly Online Giving Index published by Network for Good, social giving increased for the first two quarters in 2011 compared to the same periods in 2010. If measured purely in terms of dollars raised, the future looks bright. Social fundraiser powerhouses and early adopters like charity: water (www.charitywater.org), which focuses on bringing clean, safe water to people in developing countries, have seen dramatic success from their efforts, giving everyone confidence that social fundraising is not just a passing fad but destined to become the cornerstone of fundraising campaigns. 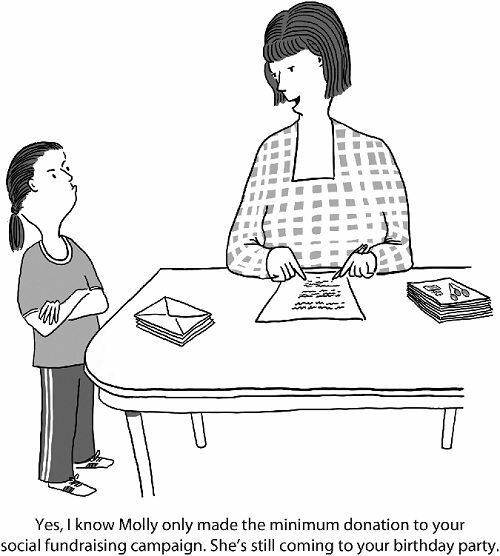 However, social fundraising’s value to a nonprofit isn’t measured only by funds raised. There can be great value in increasing the size and strength of your network. And there are other benefits of social fundraising, including increasing awareness of your cause, identifying new networks and partners, and growing the lifelong value of your donors. Below we take a look at social fundraising best practices through the lens of several campaigns and consider how to measure success and improve results. The recent growth of social fundraising practice has been powered by new online tools that allow individuals to easily set up their own pages and solicit support from friends for their personal causes. Also fueling the growth are social giving contests like the Case Foundation’s America’s Giving Challenge in 2007 and 2009. Contests are designed to encourage people to become champions for their favorite causes by launching personal fundraising appeals, setting goals, and raising hundreds, if not thousands, of dollars. Contests have also helped inspire nonprofits, motivated by cash prizes and lots of technical assistance, to dip their toes into the social fundraising waters. More recently social fundraising has been popularized by the growth in online social fundraising platforms like Causes, Razoo, Fundly, Crowdrise, and HelpAttack! that make it easier for individuals to raise money for their favorite charity. These platforms help nonprofits empower their most ardent fans to ask their personal networks to donate. These platforms not only make it easy for people to donate online with their credit cards but seamlessly integrate social media into an online campaign. The largest online giving event in history was Minnesota’s Give to the Max Day, which inspired over thirty-six thousand donors to give $14 million to more than thirty-four hundred nonprofits in Minnesota over a twenty-four-hour period. It, and similar “giving days,” incorporate social fundraising components and have paved the way for the use of social fundraising techniques by many nonprofits, both large and small. There are many good resources online about social fundraising techniques such as Network For Good. Some best practices include organizing a group of champions who are closely allied with your community to promote your cause, personalized thank-you notes, storytelling, matching grants, and working with free agents or influencers. In April 2011, Autism Speaks, the world’s largest autism science and advocacy organization, launched its second annual Light It Up Blue campaign, a unique global initiative to celebrate World Autism Awareness Day and garner attention for autism research, awareness, and services. The campaign used social fundraising to encourage hundreds of people with personal stories about autism to reach out to their networks for donations. This multichannel campaign did more than turn buildings blue. Autism Speaks engaged corporate sponsors in unique partnerships, like Home Depot selling blue light bulbs, to raise hundreds of thousands of dollars and allow families to light their homes blue. In addition, the campaign encouraged thousands of people to create local events. 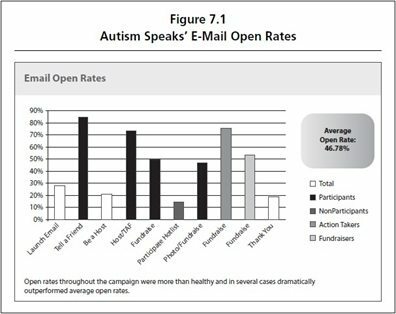 The blue Web site component enabled the organization’s supporters to easily set up a personal fundraising campaign and ask friends, family, and neighbors to make a donation to Autism Speaks. Pauline Murphy, whose son Joey was diagnosed with autism, built a blue Web site to encourage her friends and family to give. Her goal was to raise three hundred dollars, which she surpassed, reaching over twelve hundred dollars thanks to the combination of a compelling story and a personal, heartfelt ask for support to friends and families. The key to success was tracking the performance of targeted e-mail messages to different segments of their list, a strategy that Blue State Digital helped create and execute. Figure 7.1 shows the high open rates that resulted from this segmentation, in some cases dramatically outperforming average open rates. Social fundraising as part of an integrated campaign helps make Autism Speaks more successful. Sirkin identifies “the mix of offline actions, mainstream press, retailer support, e-mail, and social media is what got us results. Many nonprofits, especially smaller ones, have begun social fundraising and the measurement of their success using small experiments on social fundraising platforms. Whatever the size of your effort, remember to begin with SMART objectives, track results, and determine what works and what doesn’t. If the direct dollar results from a campaign are small, it is easy to assume that it isn’t worth the effort. But success isn’t measured in just dollars raised: social fundraising can expand your network and create a pipeline of new donors into your database. Although there are a number of tactical best practices, social fundraising is more effective if it is integrated with other communication channels and includes a well-thought-out measurement plan. Editor’s Note: Excerpted with permission from the publisher, Wiley, from Measuring the Networked Nonprofit: Using Data to Change the World by Beth Kanter and Katie Delahaye Paine. © 2012.